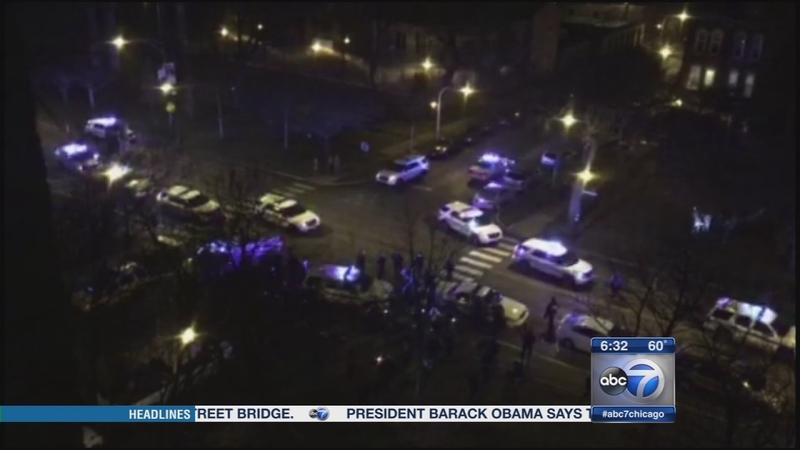 CHICAGO (WLS) -- Two men and a woman were charged with mob action in connection with a protest that took a violent turn outside a Chicago alderman's West Side home. Cellphone video provided by 12th Ward Ald. George Cardenas appears to show the scene outside the Little Village home where his ex-wife and children live. The alderman said a group of protesters attacked the house Saturday night. "They showed up with torches and they showed up with objects in their hands. Some were picked up from the boulevard, obviously, as they were starting some trouble and they ended up throwing pretty large pieces of wood onto the house and rocks into the windows and then just yelling obscenities," Cardenas said. Three people were arrested in the 2100 block of South Marshall Boulevard Saturday night. Billie Kincaid, 25, of the 1500-block of West Lunt Avenue, Efrain Montalvo, 23, of the 2600-block of West 22nd Place and Javier Ramos, 29, of the 600-block of Sandy Lane in Des Plaines were each charged with misdemeanor mob action resulting in violence to a person or property. They are due in court on Jan. 13 and were released without having to post bond. Ald. Cardenas said he supports protests, but he believes it needs to be done in a "civil manner."